This event is by invitation only. Space is limited. The #1 reason real estate agents don’t earn $250,000 to $1,000,000+ per year is simple – they don’t generate enough high quality leads. In other words, most agents are not experts when it comes to marketing themselves. You could be the most competent agent in the world but without a sufficient quantity of good leads you’ll never maximize your income. Let me introduce myself. My name is Harold Ware, founder of Maxavenue. I’ve helped top real estate agents across North America double, triple, quadruple or more their incomes with innovative and proven marketing systems. 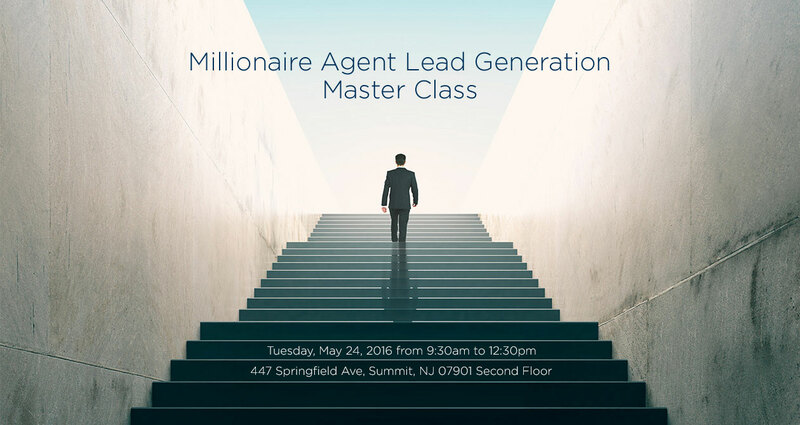 I’m hosting a free, no-obligation, Lead Generation Master Class on May 24th in Summit. NJ – the only catch is that attendance is by invitation only and will be limited to only 19 carefully selected agents. Why are we limiting the workshop to only 19 agents? Because we want to allow for more in-depth interaction with a small group of agents who are highly motivated to earn a minimum of $250,000 to $1 million annually while working fewer hours. Although it may seem impossible to earn more while working fewer hours, the truth is that “working smarter, not harder, is the ultimate secret to extraordinary success. Would you like to sell 403 homes in just three years? We will break down the case history of how I helped Dewey Whitton grow her income from $100,000 a year to earning more than $1 million annually. Dewey is now the #1 agent in her city – in 2015 she sold 134 homes and in 2016 she is on track to sell more than 161 homes. In the last two years alone, she has generated over 200 NEW customers and this does not include about 50 homes she sold from her past clients – all in 24 months. In 2016, Dewey will generate another 137 new buyers and sellers plus she’ll sell dozens of additional homes with her past clients. This means Dewey will have sold a total of 403 homes in just three years. That’s more than 99% of agents will ever sell in their entire career – all in three years! Are You Ready to Take Your Business to A Higher Level? Attending this Lead Generation Master Class will forever change the way you look at your business as a Realtor®. These fundamental marketing strategies work in any market – agents in over 40 states and Canada have used them to double, triple or more their income. When you leave this workshop, no matter how successful you are now, you’ll understand how to take your business to a much higher level. Space is Limited to Only 19 Agents — So Register Today Before the Seats Are Filled! We expect to fill up the seats quickly and to have a waiting list. To register, just click on the registration link below and fill out the form. To read the Master Class agenda click on “Master Class Agenda.” If you have any questions you can call our Master Class coordinator, Preston Stilovich at 512-779-6984. Four years ago, I transitioned from my elite coaching company that helped thousands of agents across North America, to developing Maxavenue – a revolutionary new brokerage company. I wanted to give you a sneak preview of how we’ve been helping top agents “work smarter, not harder.” There is no obligation – just great content. Overview of Dewey Whitton case history. Learn how Dewey went from earning $100,000 a year to being well on her way to earning more than $2 million a year in gross commission income by implementing the ultimate “Work Smarter, Not Harder” Lifetime Value Business Model. Learn the #1 secret of how Dewey went from earning $50 per hour ($100,000 per year) to more than $700 per hour ($1,250,000 per year with six weeks’ vacation time). That’s a 1,400% increase in income per hour. In fact, in 2015 Dewey averaged over $100,000 a month in commissions for six out of the twelve months. Her highest four months’ income in 2015 were $150,000, $133,000, $127,000 and $115,000 respectively. In 2016, she is already 40% ahead of last years $1 million+ income. Discover the little known business formula for Millionaire Realtors of how to increase your income by 400% or more, work one-quarter the hours and deliver 4X the consumer value to your buyers and sellers. Sound impossible? When you see the formula you’ll be amazed at how much easier it is to succeed, rather than struggle, when you work smarter, not harder! Learn how to stop wasting your precious time by replacing low quality Internet leads that close at about 2% of the time to an endless stream of high quality leads that close at 85% or better. That’s a 4,500% increase in closing efficiency. Learn why Realtors severely limit their income with the “Transaction Treadmill” business model. This is where agents think that just trying to sell more transactions will lead to perpetually increasing income. The truth is that most agents reach a “glass ceiling” or “income plateau” and struggle to find ways to truly break-through and exponentially increase their income. Dewey has already increased her income by a stunning 1,250% in just a few years by following the “Ultimate Work Smarter, Not Harder” Lifetime Value Business Model – you’ll learn exactly how she did it. Doubling or tripling your income (or more) doesn’t happen on accident – learn what type of training and education that Dewey practices to continually renew her professional and business knowledge and skills that gives her a permanent competitive advantage over other agents. Dewey dominates her market due to a combination of superior marketing, operational execution and the right people to help her leverage the smartest strategies and technology. Learn why Dewey and her team have become experts in Event Marketing and how this amazing lead generation strategy has changed both the quality of Dewey’s life and dramatically increased her income without wasting money on ineffective advertising or lead programs that don’t work or that generate lots of poor quality leads. Learn the fatal flaw of traditional real estate teams and why we predict this business model will be replaced by the “Ultimate Work Smarter, Not Harder” Lifetime Value Business Model for agents who want to earn $1 million to $4 million annually.